Interested in the top rated Charleston, SC lawn care services? Lawn Love is your answer to lawn care services near me. Charleston is an amazingly beautiful city with so many beaches to explore. Why would you want to be stuck doing lawn care service work in that muggy heat when you can get a top rated lawn expert to handle all of those lawn care service needs. Get an instant quote for lawn care services near Charleston such as lawn aeration, lawn mowing, leaf removal, gutter cleaning, gardening, yard care, weed control and more. 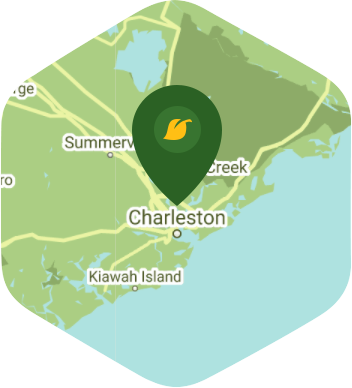 See why we're rated the #1 Charleston lawn care service company. Sit back, relax, and enjoy that sweet tea while the pros at Lawn Love take care of all your lawn service needs. When most people think of Charleston, they envision pastel antebellum architecture and horse-drawn carriages parading down cobblestone streets. That may be the Charleston other people know, but to you, it's simply the place you enjoy calling home. The real question is: Do you have the time to enjoy all the things living in Charleston has to offer you? Many people find it difficult to balance the demands of family, work, and their social lives with other responsibilities such as home maintenance and lawn care. If you find yourself struggling with this as many other people do, then you need to find out more about Lawn Love. Lawn Love is a fully insured and bonded lawn care company. Our teams of highly skilled, experienced, and friendly lawn care technicians want to bring the charm of the Old South back to your lawn. We can take care of all the weeding, seeding, mowing, trimming, clean up, and more – all you have to do is call to get started. Take advantage of our free, fast and easy two-minute quote today by calling Lawn Love at 843-806-0844. You may be surprised how far a little Lawn Love can take you! Average lawn size 6,527 sq. ft.